THE “tapisserie” trifled with? More like theatricalized, actually. 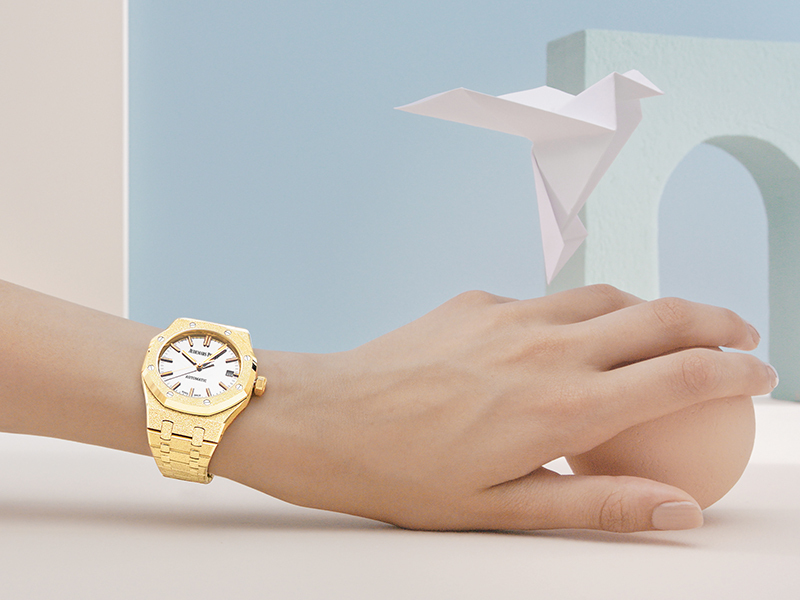 Audemars Piguet has again collaborated with jewelry designer Carolina Bucci in reinterpreting the iconic design cues of the Royal Oak as the brand announces the arrival of a new limited-edition, 37-millimeter Royal Oak Frosted Gold. The freshly released piece is a follow up on the one the watchmaker and Bucci worked on in 2016. 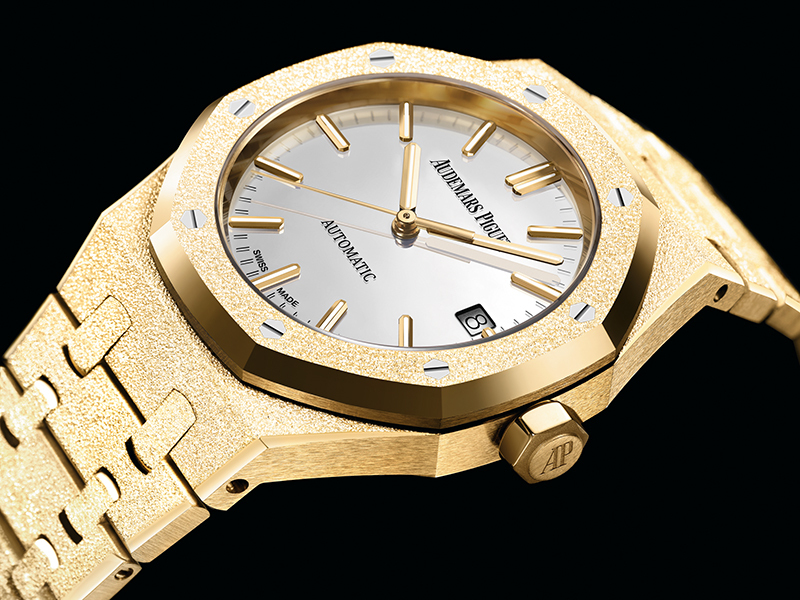 That original design collaboration, meant to celebrate 40 years of the Royal Oak for women, featured a “diamond dust” finish on the case and bracelet — essentially, it’s the product of a technique that calls for hammering gold surfaces with engraving tools to create a unique texture. 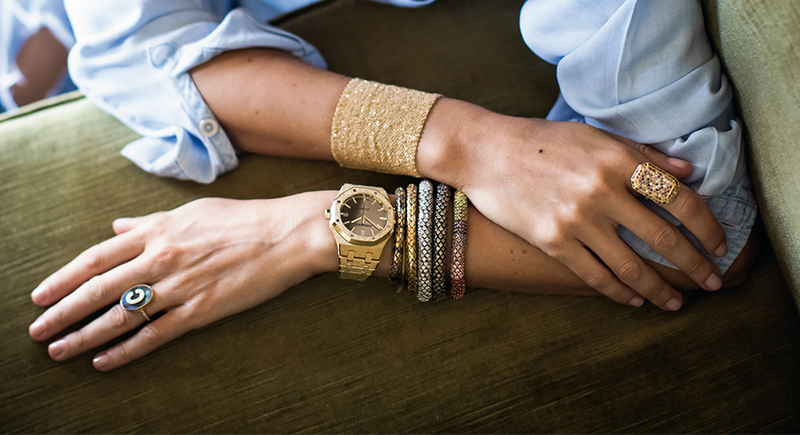 Rooted in Florence — from where Bucci hails — this “Florentine finish” is applied mostly to jewelry. It isn’t surprising then that the treatment lent the Royal Oak Frosted Gold a markedly more gem-like quality than what Gerald Genta most likely had in mind. In the 2016 version, Bucci left the Royal Oak’s distinct tapisserie pattern well alone. 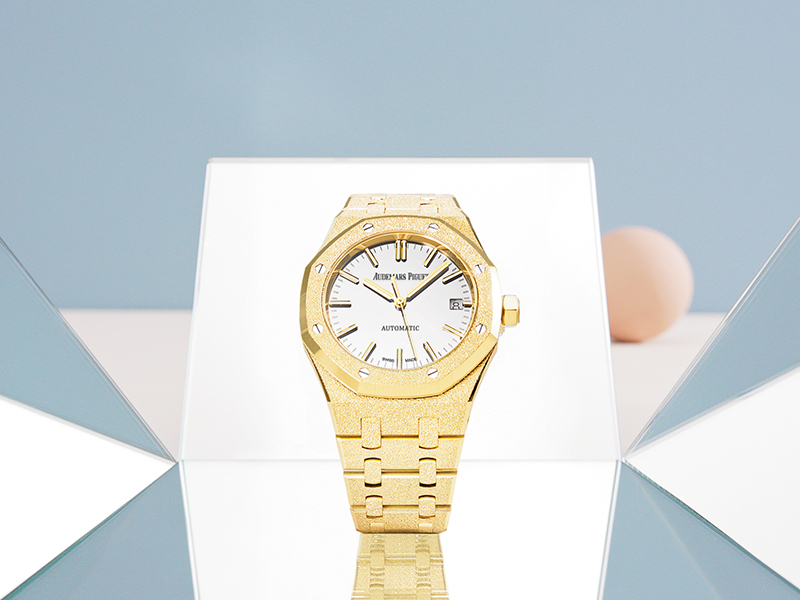 This isn’t the case in the new Royal Oak Frosted Gold (which is limited to 300 pieces, by the way, and is powered by Audemars Piguet’s self-winding calibre 3120, which has 40 jewels, spins at 21,600 and 60 hours’ worth of power reserve). 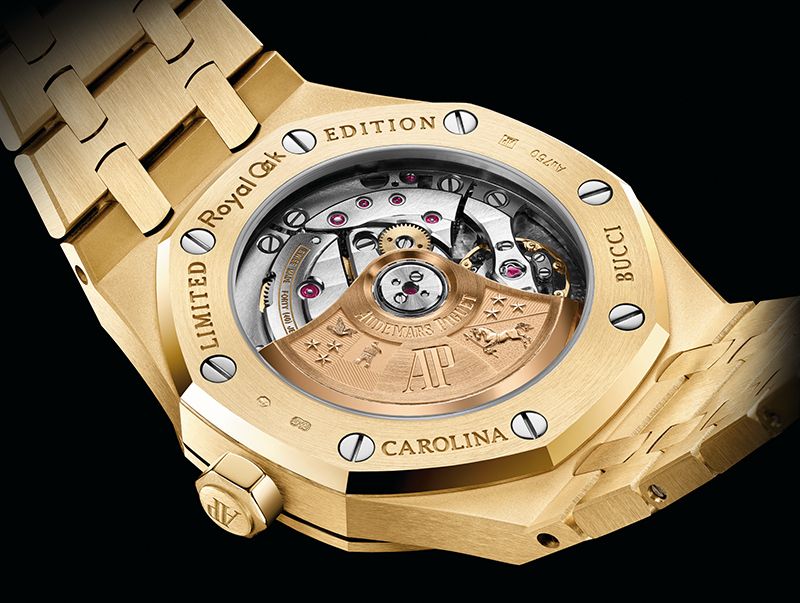 While the Florentine-finish 18-karat gold case and bracelet remain (although these are now fashioned from yellow gold, as opposed to the pink and white gold used in the 2016 pieces), the watch’s unique tapisserie pattern has altogether disappeared. Replacing it is a shiny, silver-tone mirrored surface, a result of Bucci having actually “flattened” the dial, as she calls the move. She explains the mirror-finish dial will always interact with its environment, meaning it will pick up surrounding patterns and colors. So while the dial’s surface may have lost its distinct texture, it has become flat only in the physical sense, not in the way it portrays light and shadow, if not constantly changing colors. “It’s a fresh take on an icon made in the image of a contemporary woman. I know women with a great eye for keynote accessories are going to love this,” Bucci says. 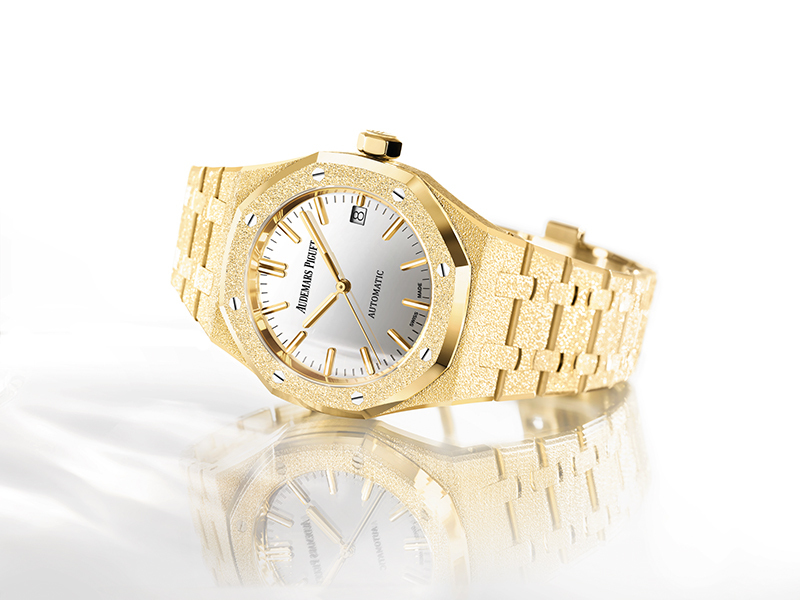 Well, Jasmine Audemars, who chairs Audemars Piguet’s board of directors, is herself a fan of the Royal Oak Frosted Gold — she has been wearing the 37-millimeter 2016 version (there were models in 33 and 41 millimeters, too) since the collection’s launch. Calling the new model’s mirrored dial as the “final touch,” the executive says Audemars Piguet and Bucci have created a masterpiece in this latest Royal Oak version. 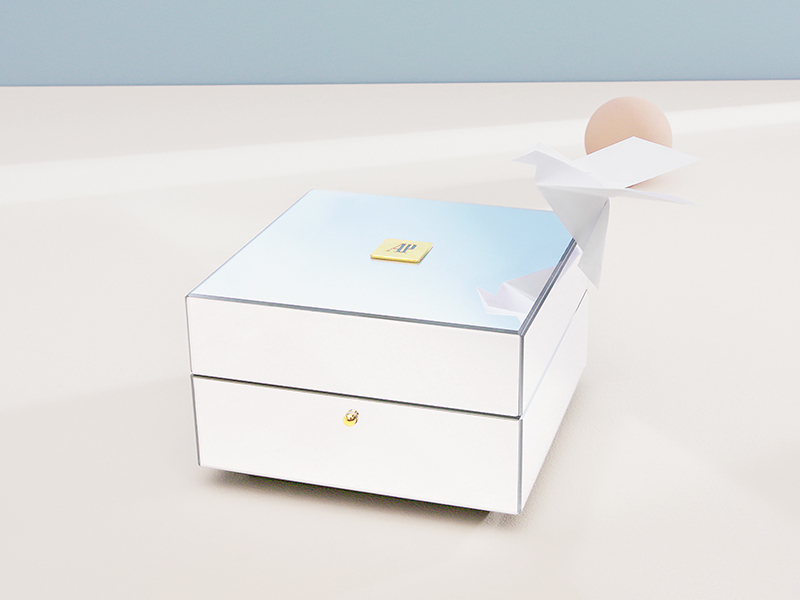 Also new is the piece’s packaging: a mirrored box bearing a Frosted Gold AP insignia. This box was designed by Bucci, too, as she believes the packaging of a luxury watch should not be merely relegated to the dark recesses of a closet.